This Custom Dropdowns can be used to record Assessment Methods for Units. It will appear in a Training Plan and is also useful for audit purposes. If you are an Australian Training Organisation who wish to produce Training Plans out of Wisenet then this is mandatory. And, for New Zealand Training Organisations this is highly recommended. Some states provide a Key for Assessment Method codes that you should enter into the Training Plan. Most states will allow you to deviate from their specified codes, but you should refer to the relevant state body for guidance. The following is a list of the Assessment Codes for each state. 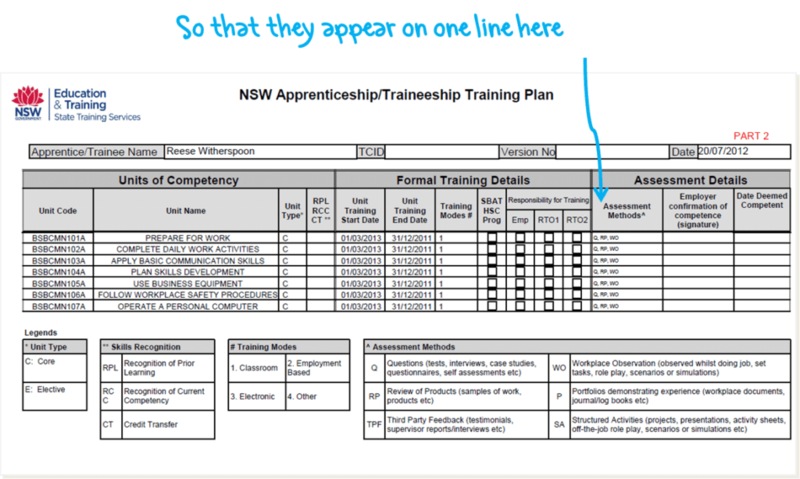 Skills SA do not currently require Assessment Details be included for Training Plans. Training can be delivered either on-job or off-job. However, if you wish to enter the Assessment Details into Wisenet so that you can generate a uReport document with this information, you can use codes that you specify (you will need to include a key), abbreviations or full descriptions.